Sure, this is a standard definition TV, and sure it is a CRT, but I love this TV. It has served us well for around 7 years and I still enjoy watching it. I take good care of the tv, use good cables, and keep it pluged into a power conditioner. However, yesterday when i turned it on to attempt to watch a little True Blood, the tv did not respond at all. I pressed the power button and saw no lights, no buzz, no hum. 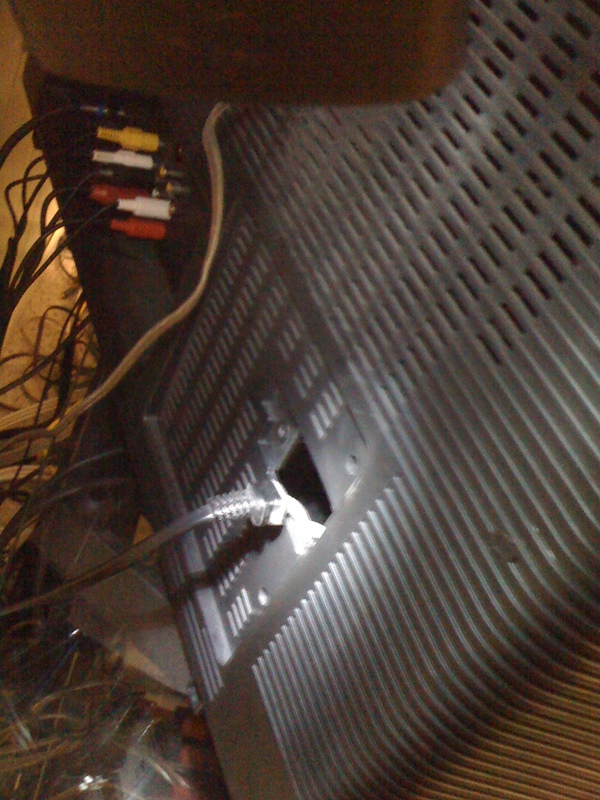 I checked all the power connections and power strips that i could but no matter what i tried, the TV was dead. 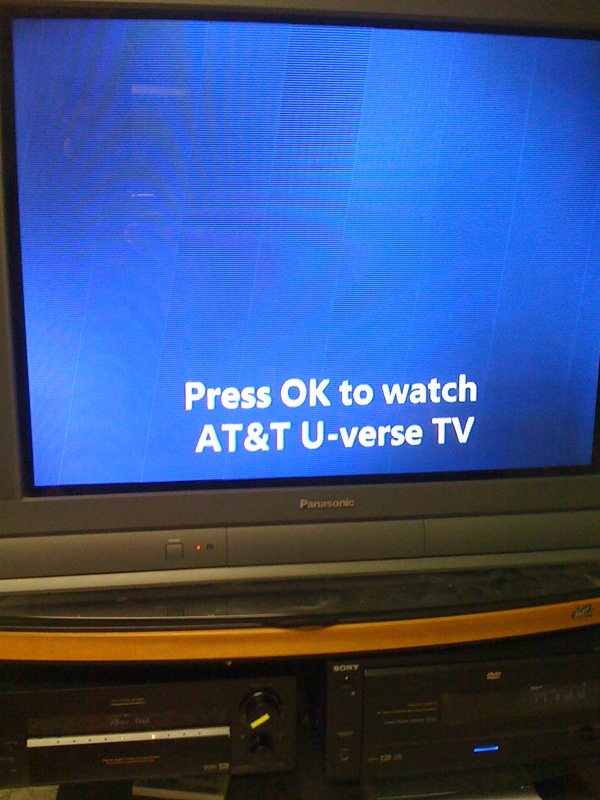 After some googling i learned that this is a fairly common issue for this TV. I also learned that the problem may be resolved by simply replacing a fuse in the power supply. I was very happy to learn that I had a shot at resurrecting the TV without having to lift the monster to move it, and without having to take the main shell off of it. BEFORE YOU DO ANYTHING, UNPLUG THE TV! Also, don’t blame me if you break anything. Proceed at your own risk! 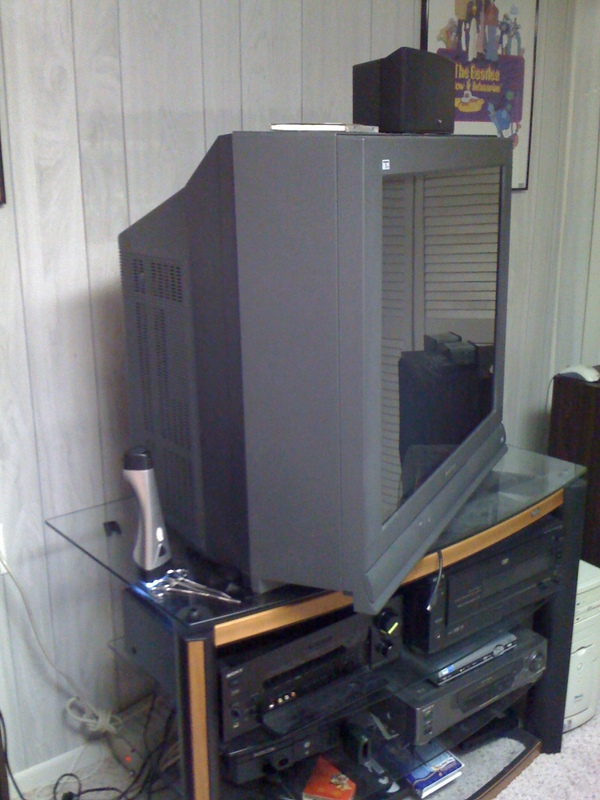 The TV is a Panasonic 36″ Tau Flat Screen Model TBM2AC0282. First thing was to get access to the back of the TV. Luckly, i was able to rotate the tv a bit on its stand and squeeze back there. My other option would hav ebeen to sait for a negibor to be able to help me because moving the tv off the stand is a two person job, and I would never ask my wife to lift something that heavy. On the back of the TV, just left of where the power cord enters the TV is a screw that needs to be removed in order to get this little acces panel open. It is pretty dark back here, sorry for the poor photo. Now that I have the panel off, i can see the fuse down inside the tv. This photo was taken after i had already removed the bad fuse. The fuse holder is in the center of this shot. It was a long strech to get down to the fuse. 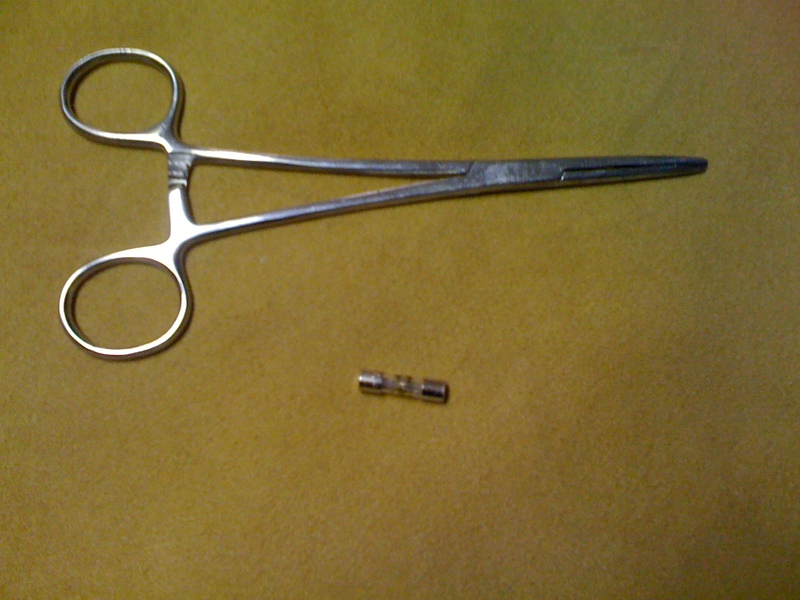 Forceps have been a key tool in my electronics toolbox for years, they came in very handy today. I do not think longnose pliars will reach that far into such a small hole. I have read about people who just cut a larger hole in the back of the tv to get better access. Not pretty, but i guess that would work if you don’t have access to something long and thin enough to reach the fuse for you. So I will be heading to radio shack today to pick up a replacement fuse. it is a 6.3a F 120V fuse. I will follow up to update the post with my results. 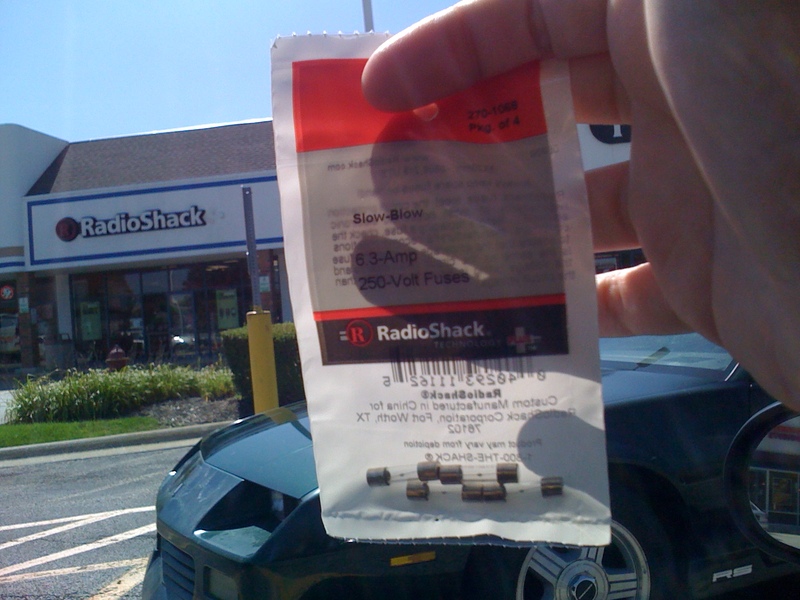 I ran out and spoke with Dennis at the Radio Shack over in Lake Zurich, IL and came home with the 4 replacement fuses for under $4. I used my forceps to install the new fuse and the TV fired right up. Thanks for this post. Just a note, the text says 6.3 Amp 120 Volt Fuse, but the pic is 6.3 Amp 250 Volt. The 250 Volt works just perfect, but people may pass up the 250 Volt thinking they need the 120. Thanks David, I am glad you liked the post. Thanks for reading! Joe, thanks for the post! Had the fuse blow in my TV today and made a temporary pair of forceps out of my girlfriend’s scissors with bandaids on the end, worked just fine. hopefully a little WD-40 will get the stickiness off. Thank you! I will be trying this tomorrow. Is there any concern using the 250v? What’s the difference using that vs trying to find a 120v? I exchanged emails with Ben (the previous comment in this thread) and wanted to add our interaction to the page for readers to see. This is being posted with Ben’s permission of course. (it has been working for a few months now) and it is just fine. thanks for your comment, thanks for visiting my blog! package for the fuses even states the voltage needs to be the same or higher. Happy New Year. Thank you so much for posting this. My TV stopping working today and it only took me 15 minutes to do the job. I wouldn’t have known where to start without this posting. I found it easier to install the new fuse with a long grabber. It is very flexible and you push a button on the end to expose 4 pinchers. I picked this up at the hardware store many years ago to retrieve parts dropped inside car engine compartments. It was hard to get the flashlight to shine in the right place using the wider forceps. Just thought I would add to an already wonderful fix it. Another satisfied customer. Job didn’t take long thanks to your instructions and pics! TV fired right up. Mark and Kevin: I am very glad to hear that this page was helpful! I love hearing your feedback. We’ve replaced the fuse again (for about the 4th time) today. TV came back on, but the picture is distorted now, bowed in on the sides. Have we big problems with our TV now? It’s been a litany of dying appliances around here lately; dishwasher, washer, and now the TV? Help! Yikes Jean, It sounds like you have trouble over there. I would say that your TV needs to be looked at by a professional. The fuse must be repeatedly blowing for a reason. The fact that you mentioned other electric troubles in your house makes me wonder if you have ‘clean’ power. Are you getting a solid 110 to 120 volts? (if you are not sure how to check… call an electrician.) Sorry to not be a big help, but it sounds like your issues goes well beyond a bad fuse. We’ve replaced the fuse about 4x over the life of the TV (10 years?). The dishwasher has a cracked plastic pipe, the washer (DON’T BUY A MAYTAG NEPTUNE!) has issues with the clutch (a known Maytag problem), neither of which are related to electrical troubles. We have had power problems in the past (hubby has a multi-meter and no qualms about sticking the probes into a wall outlet), but after the power company got our report of power spikes, they came out and replaced the neutral line on our pole. That was 5 or so years ago, so I don’t think this is related. In the past, though, with fuse issues on our TV, the TV simply wouldn’t turn on. This time, we were watching it and it suddenly shut down, displaying a lovely RGB pattern in the center of the screen for a second. 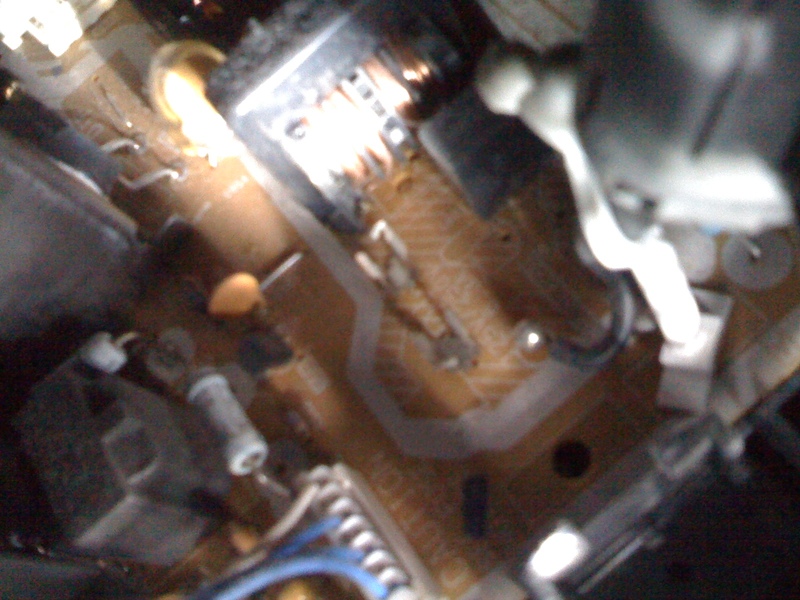 After replacing the fuse, we now have the distorted picture. My question now is, is it worth fixing? I was looking at new TVs today and for around $400 you can buy some really decent flat panel LCD sets. So, if the Panasonic’s going to cost half or two-thirds of that to fix, wouldn’t it be more cost effective to just go and get a new one? I have no idea what repair rates are in our area, I guess it’s time to investigate. Ah, thanks for the update Jean. I understand now. I am not sure what could be causing the distorted picture. The fuse is the only thing that has ‘changed’ as far as we know with the TV. So, could the fuse be faulty, or possibly in its holder in an odd way so it is not making a good connection? I had the same fuse problem with another Panasonic which I of course easily repaired myself using my fingers no forceps required. For thoses interested in the difference between the 120 and 250 voltage fuse, the 250 should allow for use overseas if you ever have the need for it. Thanks much for sharing this excellent post. I was able to fix the issue on my panasonic Tau following the steps you posted online. I used 6 amps + 125V fuse offered at Homedepot. Your article saved me considerable money and I thank you for the same. My power on would no work. Nothing was happening. Thanks soooo much for this bit info. Saved me $500, I had actually bought a TV but had not taken it out of the box. I read this fix and decided to try it. After taking my TV apart by myself and getting the part at Radio Shack and installing it my TV came on. So instead of spending $500. on a new TV, I spent under $3.00 for a fuse. I bought the 6.3 250V. Thank you for your wonderful guide on fixing this tv. 🙂 We found the piece fairly easily thanks to your photos and captions. We saved a bunch of money and space at the landfill! Hi Everybody, thank you so much for your comments. It makes me feel great to hear that this post has helped you! When U remove the fuse does it look visibly broken? My TV seams to have the same problem. At first I thought it was just the power button, but after reading this post I removed the fuse but it looks to be intact. Thanks!!!! Tried the power button on the tv today and got no response. Followed these steps and we’re back in business! We used hair trimming scissors with medical tape on the tips to remove the fuse. Hubby has a brand new pair of Radio Shack forceps now. I have a flexible USB light that I use on my laptop – it fit right in the hole with the forceps so we could see what we were doing. The first fuse fell inside the tv – hope that won’t affect anything! that 6.3a 125v is hard to find, I did what a friend sugested to me to go up to 250v and 3 amp. but no luck. The fuse was still burned out. So i ordered the so called rigth fuse for it. If this dont work then what can be the issued? Panasonic TV (TAU Flat). @Tom you can not always tell by looking. The best test to to use a meter to check if the fuse is presenting the proper conductivity. @Lynn sweet deal!! The fallen fuse will be OK as as long as it does not make contact with any metal components in there. If it shorts out something while it is moving around you will have a dead tv, or even worse… a fire. @Luis i used a 250v without even realizing it. and according to the first few commenters (top of the list above) it is fine to use a 250v fuse in a 120v system as long as the amperage matches. Good luck w/ your repair!! So! can I use a 250v and 6a fuse? because I try a 250v and 3a and didnt work, it burned that darn thing. In any case I place an order one on line (125v 6.3A)for what is supposed to be the right fuse. But I know that will take about 7 days to get here.But let me ask you this, all I need to up is my amps to at least 6 or 7? and keep it a 250v? Thank you for posting this info. kitchen tongs (the sissor type). I first popped up the close end of the fuse with a knitting needle, then grabbed hold of the fuse with the tongs. I wrapped duct tape, sticky side out, around the end of the tongs to get a better grab on the fuse. **Apparantly** 120 or 250 V is adaquate. The fuse that came out is a 120V F 6.3A. I’m now out to find a replacement fuse. The kitchen tongs with the tape held the fuse nicely and it popped right into the holder. I found the fuses at Fry’s Electronics. 5 pack for $3.99. Huge thanks for this tip, and the how-to steps! My 32″ Panasonic Tau CRT made in 2004 had no response from the power button one morning..no pop or fade of picture, just wouldn’t turn on. Googled the model number and got to your page. Ended up opening the back shell (carefully!) by removing 7 screws(4 along top, 3 along bottom edge). Found the old 6.3A/125V fuse(which seemingly looked perfectly fine to my untrained eyes)right next to where the power cord comes in through the shell and inputs on the board, gently removed it and replaced with 6.3A/250V from Radio Shack(under $4.00 for four pack of four fuses)as you did… and BAM, back in business, full power! 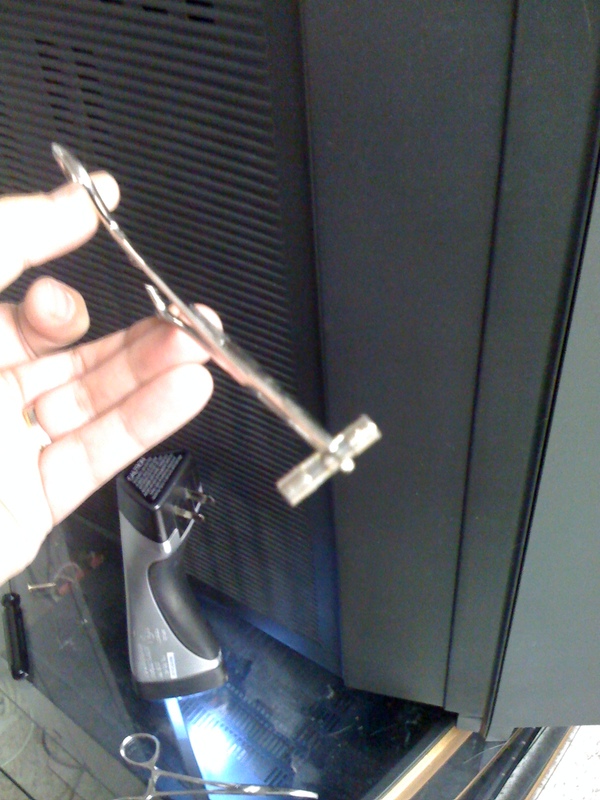 Really easy fix if you are careful and go slow…saved me a headache, $$$, and gained a few more years life for the set! 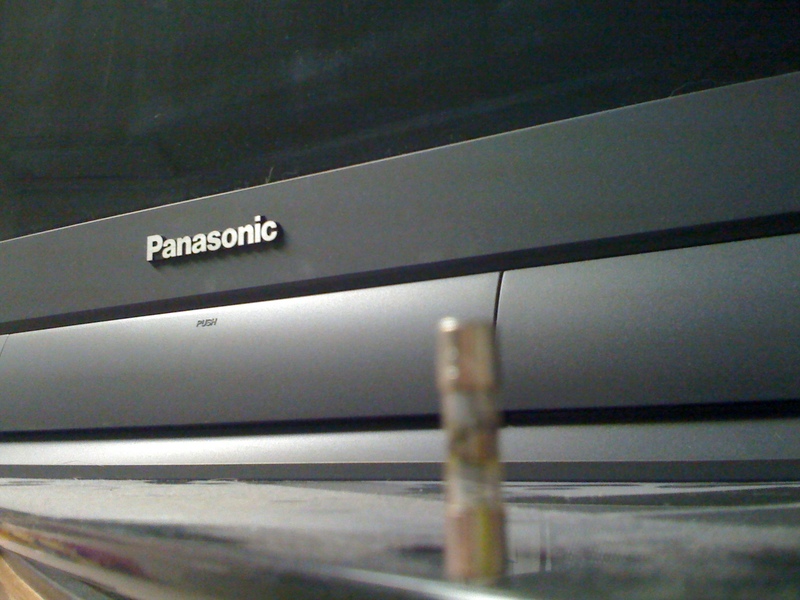 Thanks again…this post should be standard info for all Panasonic CRT owners! in and find that fuse rather than dump their potentially dead Tau! thank you sooo much it worked i also used the 250v my t.v is running good now thanks again. thanks so much… this is exactly the problem I had and your instructions for replacing the fuse did the trick! So glad I found your post! Inherited this TV and what a great picture! I’ll know how to fix it when it quits. Question- can I hook up an HDMI cable directly to the back to stream Netfix? I can’t find anything on the Internet about this. Thanks! I have the tv opened and have located the fuse. however I am haveing trouble popping it out. any pointers? OK. I got it out and replaced it. Now when I hit the power button I hear a click but i still get no picture and no red light. Any suggestions? My 32″ panasonic tau is workin’ again.. thanks for the post..
Our sound went out – any ideas? Everything else still works. My Remote is broken any ideas on what the best replacement would be? AL.W try this one http://www.ebay.com/itm/PHILIPS-CL043-SRU3003WM-17-/190668985739 I have the same TV and same remote, all original functions work with this one. Great information. Worked perfectly except that now I have some of my channels appearing in letterbox format. Does anyone know how to fix this on this model. The manual is of no help. I’ve had this problem with my TV too, and I went to Home Depot and got the wrong fuse because I’m impatient and stupid–I bought GMA-6A 6 amp fuses and I’ve run through four of them in the past month. I’m going to Radio Shack to pick up the right fuse. I DID, however, want to comment on something–Joe’s right about needing the forceps for reaching the fuse, but I came up with an alternative. I just bought a small saw and cut open the back of the TV around the power cord so that I could reach in with my bare hand to replace the fuse. It was much easier. Given the prevalence of flat screens nowadays, I figured what the heck, I’m not going to sell this TV any time soon, so why not just cut open the plastic so I could reach the fuse? It’s made replacing the fuse much easier. Now onwards! I’m going to Radio Shack to get the right fuse. Thanks you guys! Hey Joe, thanks for the great thread. I followed all the steps that led me to the fuse, although I did remove the entire back of the TV to make it easier. However the fuse wasn’t blown. What happens is when I press the power button it turns red, you can hear it firing up, and then just before the picture should come on it cuts off. When I press power again, nothing happens. If I unplug it, and then plug it in again, the same thing will happen again. Well all of your post sounds great, mine went out years ago but after reading the post I said what the heck just try it, went to radio shack they did not have the 6.3\120 so she gave me a 6\120 I managed to get my hand inside the TV and popped the fuse right in the spot. Plug it up sounded like it was going to come on but whence I looked at it just a small blue and white spot in the middle of the TV, not sure wheat this mean was I not suppose to touch the fuse by Jane?, was it the wrong kind of fuse? What does this mean? Cool, Thanks, I knew there would be a fuse close to the power inlet just not sure how to get at it without tearing the rear cover off. at that point I would have replaced it with a new refurbished flat screen for $300, only because this old thing weighs 200lbs and is only used for over the air signals and the kids Wii. I was minutes from doing that when I ran across your post. With radio shack now closed I was only able to get the 6amp fuse from the hardware store, we’ll see how long it holds out. But for a TV that a buddy gave me 8 years ago and he used it for 6 or 7 lets see just how long it will last (old school stuff is best! ).